Mustachioed fans will receive free admission to the contest, and those without a mustache will be given one as they enter the ballpark. 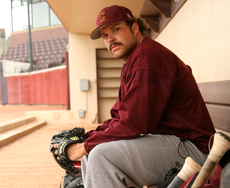 Many of Collmenter’s South Bend teammates have jumped on the ‘stache bandwagon as well, and fans will engage in a pregame vote to determine which player possesses the best upper-lip hair. Making the Silver Hawks’ mustache promotion even more fortuitous is the fact that it is taking place simultaneously with “Hug Your Plumber Night.” Early-arriving fans will receive complimentary plungers, and any fan who wishes to embrace a (hopefully mustachioed) plumber can do so for just $1, with the proceeds going to charity. “It’s a natural fit, and I’m sure everyone will get along just fine,” said [Silver Hawks’ director of sales and marketing Amy] Hill regarding the evening’s synergistic promotional endeavors. Eli Rumbler? Chance Wheeless? Are these real names?!?! Could this get any more deliciously bizarre???????? But an even more impressive aspect of the promotion is that the club snagged a coveted endorsement from the prestigious American Mustache Institute. 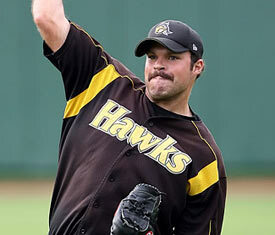 But Collmenter has no plans to go into hibernation anytime soon.